The church of St. Helen at Burghwallis is notable for the unique combination of large quoins with 'herring-bone' style masonry in the walls. Although no church was mentioned in the 'Domesday Survey' of 1086 there are several features that point to a pre-Conquest origin for the foundation. "The megalithic side-alternate quoins ... are an ... indication of pre-Conquest work but do not allow a more specific dating. ... The Taylors class it of Saxon period 'C' (950-1100 AD) on the evidence of its simple plan, plain square plinth, quoins and wall thickness." Another indication of an early origin is the dedication to Helen, or Ellen as it is named in early documents. Ellen was the Celtic goddess of armies and roads, being one of those worshipped by the Roman Army. As the site of a Roman Fort is about a mile from the church it is tempting to surmise that upon conversion to Christianity, during the time of Constantine, the Romans re-dedicated their place of worship to Helen, mother of Constantine, it being convenient to keep a similar name to cover the transition from one religion to another. This, however, would imply some form of continuity from any Romano-British still residing in the area of the fort when the Roman armies withdrew through to the Anglo-Saxon settlers, whose descendants built the early Church. The herringbone masonry so prolific at Burghwallis is of thinly bedded Upper Magnesian Limestone, most likely quarried only a stone's throw away to the south of the church. The larger blocks of red sandstone used in the plinth and in various areas of the walls would have come either from a deposit of glacial sand and gravel also only a few hundred yards away, or else from an outcrop of 'Bunter' sandstone at just under a mile distant. Later builders used the more thickly bedded Upper Magnesian Limestone, which was quarried about a mile to the west of the village. The early church consisted of nave, chancel and possibly an earlier tower, indicated by the presence of a doorway with Anglo-Saxon type features set in the west wall of the nave at the level of the second stage of the tower. The present tower is of 12th century design, in three stages. The archway between nave and tower has broad half-cylinder responds rising to heavy square abaci, although the arch above is sharply pointed and appears to be a rebuild, probably of the 13th century. The embattlements, with gargoyles and small crocketed pinnacles, are of the 15th century. Early features include the round-headed pre-conquest south doorway, the aforementioned megalithic side-alternate quoins, and the thickness of the walls of the nave and chancel; these, from a plan of the church, do not appear to be perfect right-angled parallelograms. The East end of the chancel was extended at the end of the 14th or early 15th century and the East Window dates to this period. It is not however in the original position, being removed and re-inserted at a higher level when the chancel roof was altered. The priest's doorway in the south wall of the chancel is a 13th century insertion, and although the windows of the chancel are of 13th to 14th century form they were single lights in 1864, the tracery being part of the restoration. The Lancet window in the Nave dates from the early 13th century, although the external stonework has been restored. The early 16th century square-headed window of three lights in the south wall of the nave contains some remnants of mediaeval grave slabs. The south porch was added in the 14th to 15th century. There was a north doorway with a square head and jambs cut of small stones, possibly of late mediaeval origin, but this is now blocked, and partially obscured by a 19th century buttress. Much of the Church as seen today relates to the restoration of the Victorian period, during the incumbency of the reverend Francis Peel. Plans were prepared in 1864 and J. L. Pearson, whose most famous work was the building of Truro Cathedral, supervised the work. The Chancel floor had been re-laid about 1850. In 1865 the Chancel Arch ' was found under the old plaster', and was subsequently taken down and restored. During the 1860's the old box pews were replaced by bench-type ones of 'oak suitably carved', which are still in use. In 1870 'the old Jacobean pulpit and reading desk were removed and carved oak ones put in their place.' (These have now also been replaced.) The three bells were cracked and were sent away to be recast; they were re-hung in January 1871. An Organ was purchased in 1875, an Organ Chamber being built on the north side of the chancel to accommodate it. The Early English two-light window in the north wall was originally in the north wall of the Chancel. The oak Rood screen is late mediaeval, probably donated to the church by William Adam, Lord of the Manor of Owston but originally of Burghwallis; he is buried a few feet away from it. (A similar screen survives in Owston Church, with the initials W A on the gates.). During restoration of the Chancel arch it had been removed and stored in the granary. Probably it suffered some damage during the process, because in 1881 the village carpenter, presumably Charles Firth who was recorded as a Joiner and Wheelwright on the 1881 Census, restored it to its present condition. The village Blacksmith, in memory of his wife Margaret Scurrah who died 25th July 1930, made the iron gates at Burghwallis. The pre-Reformation stone altar slab was also found buried during this restoration work, and has now been restored to its original position. During Rev. Kidd's incumbency, 1928-1955, the Victorian wooden pulpit was replaced by a stone one, and two side altars were added. The organ was removed to a position under the West Tower, thus allowing the old organ chamber to be used as a vestry. A choir gallery was put in; this allowed the choir to be restored to the West End of the church, leaving the old choir stalls in the chancel free for the use of servers during services. The Font has a shallow circular bowl set upon an octagonal shaft, and is situated to the west of the south door, in the south-west corner of the Nave. There are several early monumental stones. The remains of some have already been mentioned as having been reused in the building. Several others survive in the Nave and Chancel floors, although they may not be in the original positions. Two are noted as being of Richard Lyndale, Rector from 11 Oct. 1431, who died in 1460 and Henry Gascoigne, Rector from 27 May 1521, whose will was dated 22 Dec.1540. There is also a brass figure of a knight in plate armour from which the inscription has been removed; it is thought to be of Thomas Gascoigne, who died in 1554. 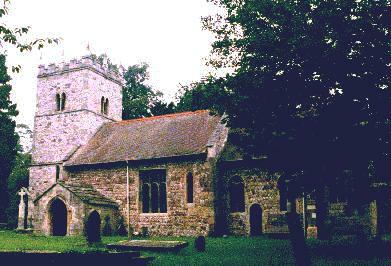 More detailed information can be found in 'Saxon Churches in South Yorkshire', P.F. Ryder. Indexed transcripts of the Burghwallis Marriage's Burials and Roman Catholic Baptisms are on the Parish Records pages of this site.